On Saturday we went to our friend’s house to lounge at the pool. 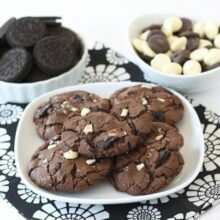 Before we left, we baked Triple Chocolate Oreo Chunk Cookies to take to the pool party. Our friend’s love our sweet treats so I knew we couldn’t show up empty handed:) When we arrived, everyone was already in the pool, but as soon as they saw the cookies they hopped out for a cookie break. The Triple Chocolate Oreo Chunk cookies were a hit! 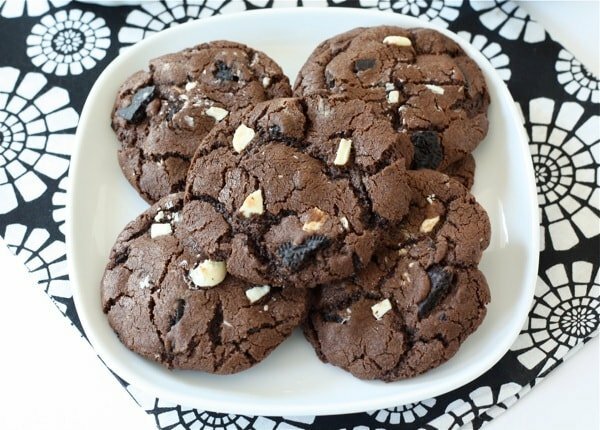 These cookies are loaded with chocolaty goodness. First, I added cocoa powder to the dry ingredients. Josh chopped up semi-sweet chocolate, white chocolate, and Oreos to add into the cookie dough. The cookies only take 8-10 minutes to bake. You do not want to over bake them. Take them out when the cookies start to crack and still look gooey. They will set up on the baking sheets. You want the cookies to be soft and chewy. 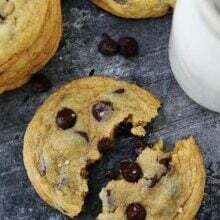 If you are looking for an over the top, decadent, out of this world, devilish dessert, make these Triple Chocolate Oreo Chunk Cookies. They certainly fit the bill! 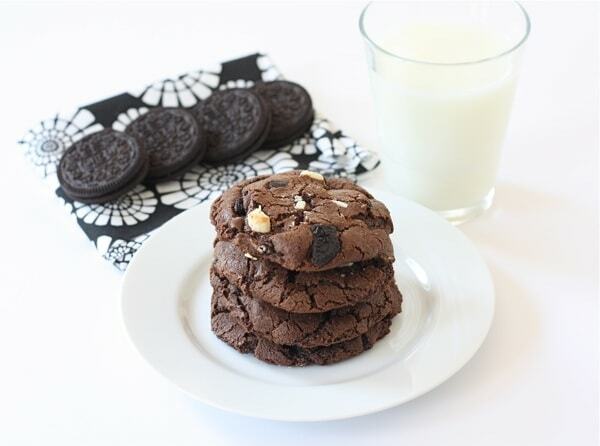 And don’t forget the milk-these cookies are perfect for dunking. Enjoy! 1. Preheat oven to 375 degrees F. Line a baking sheet with a Silpat baking mat or parchment paper. Set aside. 2. 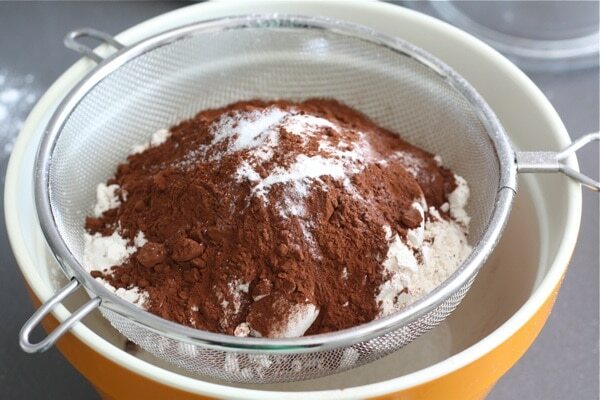 In a medium bowl, sift flour, baking soda, salt, and cocoa. Set aside. 3. With a mixer, cream butter and sugars together until smooth. Add in eggs, one at a time. Next, add in vanilla extract. Mix until blended. 4. Slowly add flour mixture to sugar mixture and mix until flour disappears. 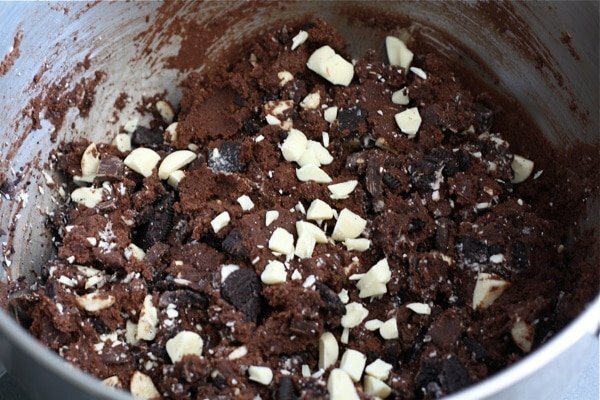 Stir in chocolate chunks and Oreos. Drop cookie dough by rounded tablespoons onto prepared baking sheet, about 2 inches apart. 5. Bake cookies for 8-10 minutes. Don't over bake. Remove from oven and let sit on baking sheet for 3-5 minutes. Move to a cooling rack and cool completely. Mmm perfect cookies! Love these. Oh my, these look delish! Maria these look soooo good! White choc, dark choc, Oreos…seriously perfection! i’m dying…these are the PERFECT cookie! What a FUN recipe! I love how you chopped up the oreo. Bet all those chunks of goodness really make them awesome. Hope you guys had a nice weekend! Holy cow these look amazing! I also make sure to “check” my cookies before I serve them, although sometimes I feel the need to check a few too many, lol. My oreo loving husband would LOVE these! Gah we love these! 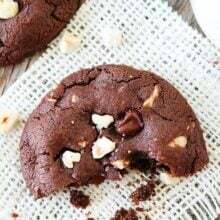 We’re all for as much chocolate (and cookies) in a cookie as possible! I think Wes would love these. I’ll definitely try these out. YUM! I just made a cookie with mini Oreos this weekend, too. Oh goodness, all that chocolate in one post! Looks scrumptious! These look absolutely amazing! I’ll be making these next week for my cousin’s baby shower! Thanks for the great idea! You are welcome! Have fun at the shower! Oh wow. Those look like heaven on a plate! Oreos in anything is a winner for me. Yep, these are a winner for sure. Lots of good stuff in these cookies!! 3 kinds of chocolate + oreos – I am sold! Oh my! I will be making these very soon! They look amazing. These look ridiculously good. I am in a meeting (shhh) and my colleague next to me wanted to dive into my screen. These are keepers! These look so wonderfully naughtily delicious. These look sinfully delicious! Definitely going to try them! Definitely over the top, Maria. 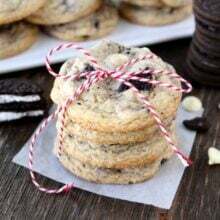 I’ve made ccc’s with Oreos, but not a chocolate cookie–YUMMY! These seem pretty fantastical in every way. I mean, each of the mix-ins alone would make for great cookies…and then when you put them all together, the whole is definitely greater than the sum of its parts. It looks as though you pushed past your cookie block with flying colors, Maria. These look wonderful! Mmmm – a chocoholic’s dream! That’s a lot of chocolate in a one bite! If I were anywhere near a pool, meaning in a bathing suit, I don’t think I would get near these cookies because I probably couldn’t control myself. Yum Maria! These look so good! If only I weren’t on a diet! Oh wow….I bet those WERE a hit! I know they would be around here! You cant beat all of that chocolate!!! Heavenly days! These look amazing! Yum! No wonder these were a hit! 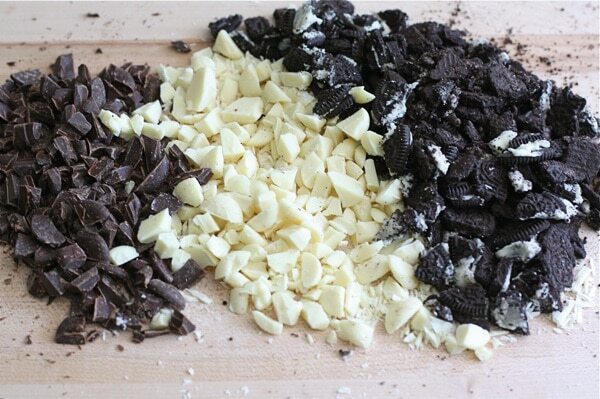 Chocolate, White Chocolate, and Oreo’s….delish! I love visiting your blog – I always find the bestestest recipes. And photos! These cookies must be ammmmazing! What? I need some of these! I gasped when I saw this post. 🙂 These look divine! This gets a triple yes from me, yes I want one, yes I want too, oh who am I kidding yes I want them all!! Looks delicious! Creative and fun! Beautiful pics as always! Pretty sure these are going to be made by me in the very near future. AWESOME. Wow, how could these not be a hit?? They have all my favorite things in them!! ok, REALLY!?!? You had to go THERE??! I mean just cuz your prego and all….Sheesh. Those seriously look amazing. I’m going to try to wait at least a week before I make them, otherwise I might just eat the whole batch! YUM!! How insane do these look! My sister is an oreo fan so I bet she would love these. I saw this post this morning and wouldn’t you know it, these are in the oven right now! I can’t wait to see how they turn out! You had me at triple chocolate… They look amazing! This looks soooooo good! I will have to make some. Maybe I can use reduced fat oreos to make it a little less fat. Wow. These look absolutely fantastic. I can’t wait to try them. Wow, these cookies look fabulous!! I think these are going to be my new favorite cookie very, very soon! You weren’t kidding when you tweeted about these cookies! I just printed off the recipe because I just know my boys will be thrilled if I bake them! YUM! I have just made these cookies and I have to say that they are absolutely divine! They taste even better than they look, if such a thing is possible. Thank you , thank you, thank you for posting! I’ve made these before but didn’t put in white chocolate. I should definately add in the white chocolate next time. YUM! Thanks so much for sharing all your wonderful receipes. oh man, no cookie dough while pregnant? (well, duh.) that must be reason #93046 I know I’m still not quite ready 🙂 These cookies sound fantastic, your friends are quite lucky! Keep the awesome dessert recipes coming! Made these cookies for Fathers Day lunch and EVERYONE wanted the left overs!!!! Generally I bring home half or more of a dessert but not this one. These cookies look amazing! 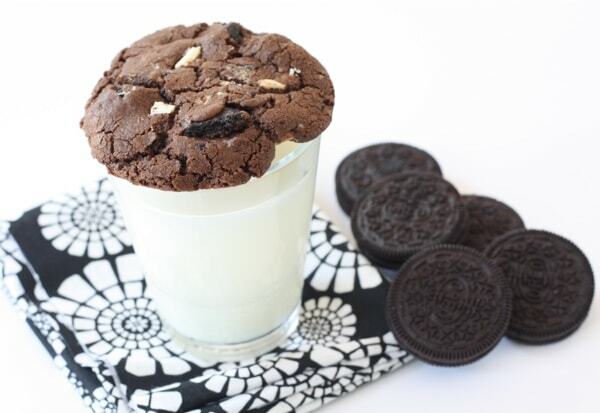 I would have never thought to add oreos to a cookie – great idea! These cookies look AMAZING!! I will be making these for my hubby’s work in the next few days!!! So I made these tonight except I didn’t have any oreos or any white chocolate chips. So I used a whole bag of Andes creme de minth chips, and dark chocolate chips. Hello! These are amazing! I am planning on taking them to a friend’s house tomorrow for a get-together, we’ll see if they last that long! OMGoodness!! Just made then and they are Delish! I ran out of semi-sweet chocolate and only used about 1/2 cup but still came out good! LOVE THESE!!! The more CHOCOLATE, the better!!! I love your blog and have made a LOT of your recipes (which are always great), but this is my first time commenting. I bookmarked these cookies when I first saw them back in the summer but only got around to making them this week. I made them for the last day of class before winter break, and my classmates loved them. Instead of Oreos, I used Trader Joe’s Candy Cane Joe Joes (they’re like peppermint Oreos), and they added a great Christmas flavor to them. 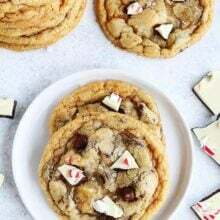 These cookies are so good, they are going on my Christmas cookie plates this year (along with several other of your cookie recipes). Thanks for all of the great recipes! Thanks for saying hi Jen! Glad you are enjoying our recipes! Oh my! The sin! Can hardly wait to give these a whirl in my kitchen. One question: I plan on giving some friends frozen cookie dough for Christmas this year. Get some cute containers and festive tags, and pop some ready-made dough balls inside so they’ll have cookies on hand whenever they’re craving. I’m wondering, do you think this dough would be a good candidate for such gift giving? I’m wondering if they oreo chunks wouldn’t lend themselves to freezing. Any ideas? What a great gift idea! I haven’t froze the dough before, but I am sure it would be fine. Thanks for the reply. Are you certain, thought, that you used Dutch cocoa in the pic above? Based on the info found at the website below, it looks like yyou used natural cocoa powder, not Dutch pressed. The colour in your pic is too light for Dutch plus Dutch doesn’t generally get used with baking soda. Amazing! My hubby is not too much of an oreo fan, so I removed the oreos and added in more chocolate and they are AMAZING!! I am referencing your recipe on my blog! I didn’t think I liked chocolate. I was on a Christmas baking extravaganza, and for my chocolate-loving sister’s sake, I decided I’d throw these into the mix. They are GREAT! Even for the non-chocolate lovers! Thank you so much. They freeze and thaw wonderfully.. I’m enjoying one now! WHERE CAN I GET dutch processed cocoa? AND WHAT IS IT? Look in the baking aisle. It is a darker cocoa powder. If you can’t find it you can use regular unsweetened cocoa powder. I needed a new recipe for the lunchboxes this week. I’m going to sub GS Thin Mints for the Oreos since we have those in the house. I can’t wait! OMG, these are beautiful! I just took them out of the oven – and the house smells amazing. We ate our first ones with crème fraiche…deeeelicious! Thank you so much for this recipe! SO glad you like the cookies! Made these, they are to die for! Thank you for sharing the recipe!! I am thinking of making the dough today, freezing it and then rolling them out tomorrow. Do you think that the oreo will become soggy or the cookie will not be as good as it would be if I did all in the same day? 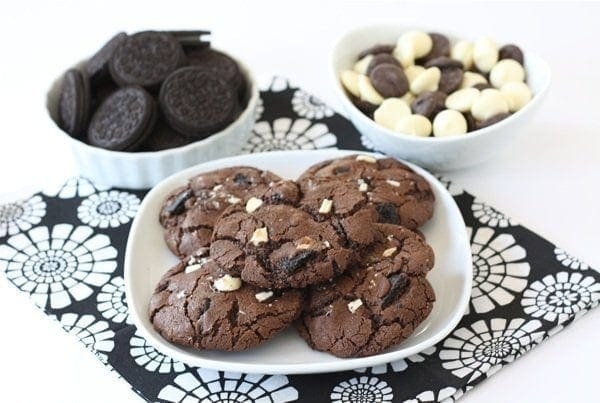 The best cookies i´ve ever bake! these are literally the best cookies I’ve ever had! perfectt!! Yay! So glad you liked the cookies! Hi! I was looking on your site for a simple chocolate cookie to add to my Christmas plates and found these. They look good! Where do you buy your chocolate and white chocolate chips? The shape is unusual – I like that they seem to be flatter and thinner than the typical grocery store varieties. Hi! I bought chocolate discs at Gygi in Salt Lake City and chopped them up. Regular chocolate chips will work though! Made these last night– they were really good! The cookie dough was super thick, even before you mixed all the goodies in, but it all worked out just fine. Maybe I’m just not used to cookie dough batter anymore since I make more cakes and stuff. I used Trader Joe’s Jo Jo’s instead of Oreos too, and it worked great! Thanks for the recipe! Made these last night for a work meeting and they were a hit! I used regular cocoa and they were wonderful but I definitely want to try dutch processed the next time around for the deep, rich cocoa flavor! Very easy to make and one of my favorite cookies! I’ve tried a lot of other cookie recipes and keep coming back to these.